Man's fascination with finding new ways to travel on the open ocean never ceases to end. 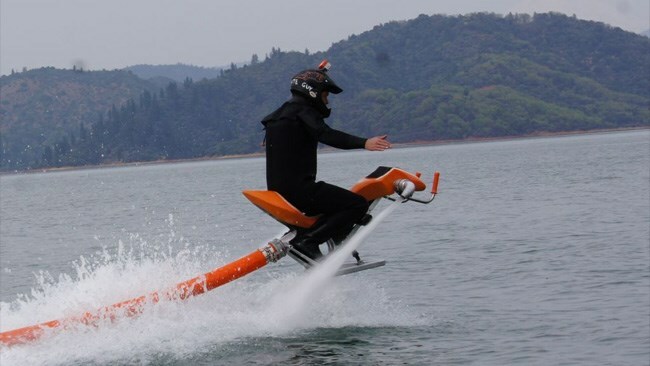 Lately we've had amphibious cars, flying hover crafts and water-powered jetpacks. Now the latest insane contraption to join this mix is the Jetovator — a water-propelled, wheel-less motorbike. Man's fascination with finding new ways to travel on the open ocean never ceases to end. Lately we've had amphibious cars, flying hovercrafts and water-powered jetpacks. Now the latest insane contraption to join this mix is the Jetovator — a water-propelled, wheel-less motorbike. And jeez it looks like fun. The Jetovator operates by sucking water through a 15m hose which then propels the rider onwards and upwards at speeds of up to 40km/h and distances of 9m. Other party tricks include the ability to barrel-roll, back flip and dive 3m underwater. While it looks deadly, Jetovator says its product is easy to operate and allows "first time riders to fly like professional pilots". Jetovator will sell you the starter kit for around $9,000 which includes the motorcycle-frame body, necessary plumbing connections and the 15m hose pump. However the Jetovator cannot operate under its own power, so you'll need a mate to follow you around on a jet-ski to provide juice via a power cable (suffice to say this isn't included).